Since my first committee meeting freshman year, I have been in awe of the magic that is THON. THON brings students together and gives us an opportunity to make a tangible impact on the world. I knew after first meeting that THON would be “my thing” in college. Being on a finance committee since my freshman year, I have been able to see both THON as a whole and the finance committee evolve. I wanted to play an even larger role in that change, which is why I applied to be the THON 2019 Finance Director. I was thrilled at the idea of seeing THON from a wider lens, and making a difference from a different perspective. I have always been motivated by my leaders on Finance, so I am excited to be able to give back and inspire the next generation of THON Volunteers to continue as THON’s driving force in finding a cure. 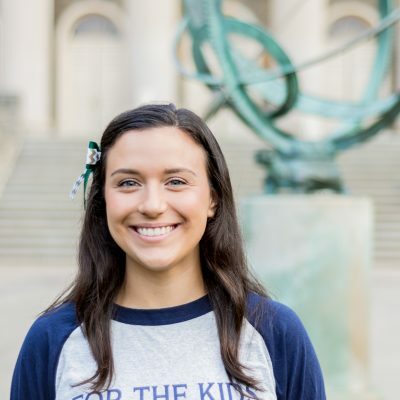 What are your main duties as the Finance Director for THON 2019? As the Finance Director I am in charge of creating and maintaining the THON 2019 budget. I also work to assure that all monetary donations are processed with integrity by the 25 captains and 75 committee members. My favorite THON memory is when I visited Hershey my sophomore year. We were there when a Four Diamonds child was ringing the bell for his last day of treatment! It was amazing to see the support of the doctors and nurses who had been treating him over the course of his chemo, and his entire school was able to Facetime in to cheer him on. That was the first time I was able to witness the reality of the changes we are making in these children’s lives. It made me even more passionate about working toward a cure so every child fighting can ring the bell, and so one day we can ring the bell in celebration of a cure. I have been involved in Penn State Lion Scouts since my freshman year. It was so much fun to be in the stands as a freshman and experience my first THON with them. We have incredible THON Chairs and since I first joined, we have almost doubled our total and gained an extra family and dancer!